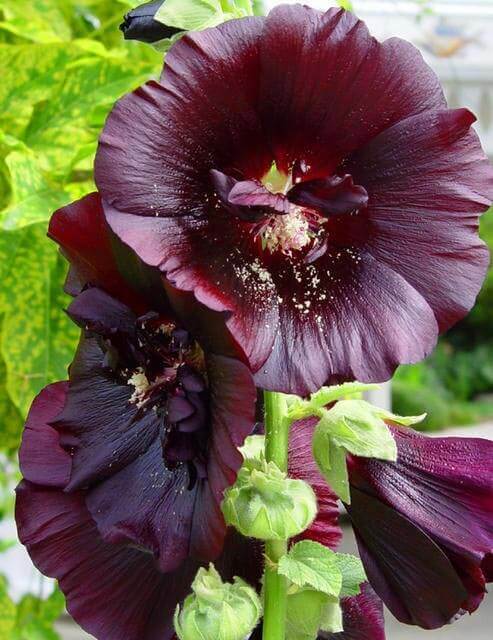 Alcea, commonly known as hollyhocks, are native to southwest and central Asia. A few are also native to southeast Europe or Egypt. They are biennial or short-lived perennial plants growing to 3.5 m tall, with broad, rounded, lobed leaves and numerous flowers, pink or yellow in the wild species, on the erect central stem. Hollyhocks are popular garden ornamental plants. They are very drought resistant, and do well in full sun locations that might be too hot or dry for other plants. They produce large, flat coin-shaped seeds (1/2" diameter) that seem to grow easily wherever they drop. Round buttercup shaped flowers. Dark purple to dark red flowers. Summer flowering. Dark purple to dark red flowers.